China, Olympics, and human rights…oh my! Ricky Reilly might be gone, but the back page of Sports Illustrated is still pumping out some worthwhile pieces. S.L. Price wrote one about the Olympic committee granting China this year’s summer Olympics with the hopes that China would work on its human rights. But they haven’t. The Olympics are here and the international community and the Olympic committee are turning a blind-eye. Hemingway, Thoreau, Emerson, Twain, and Melville are just a few of the writers who have NOT influenced me. I would never insult them like that. Forget melting ice caps, rising sea levels, displaced people, spread of disease, and other bad stuff. What irks me the most about climate change and, in general, our crappy stewardship of our planet is the disappearance of quality dive sites around the world. Here’s a NY Times piece with more evidence that our dive sites are fading fast. That’s how many I wrote about the world’s largest dam today. If you look close at the bottom of the pic you can see fishermen catching the world’s smallest fish (note: you can’t see the fish). …and the chapter on China is winning. I’m on day two of pounding my head into my desk. My mantra: Keep it simple stupid. But that darn country is so complex! I was scrolling through photos the other day, searching out details, and I came across the photo below. It seems like a nice photo of me and some Bangladeshi garment workers, doesn’t it? Well, you don’t know the whole story. I had forgotten all about it. Such memories are repressed. See that dude to the right of me? I don’t want to go into details, but as this pic was taken, he was trying to molest me. If you look close, you can see my innocence drifting away. Following this photo, he received a quick elbow to the ribs and then he disappeared, back to whatever creepy lair he crawled out of…. The cat, Oreo, that let’s me occupy her house has now decided the chair – which was the only thing in the entire home which was solely mine – is pretty cozy. We’re sharing for now. But I foresee a future where I will write on the floor and she will supervise from above. (Outside) Today I though about clawing you to pieces and feasting on the remains. But I didn’t. (Inside) If that’s not love, what is? I’ve made a static page here that will feature cat’s and their writers…. In front of the flip flop factory, the flip flop fabricators wear flip flops. How fun is that? I’m having an awesome day writing and that sentence just made it twice as awesome…. 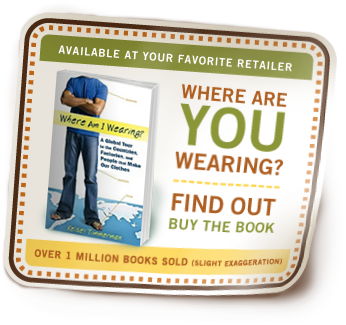 I recorded another interview for the World Vision Report about Where am I Wearing?. We recorded this one from Ball State’s David Letterman communication center. If you’ve listened to the previous interviews there’s not much new in this one, but it is much clearer. All of the other interviews were recorded continents away over the phone. This one was recorded over an ISDN line in the studio and it sounds like I’m in the same room with Peggy, the host, even though she was in Texas. It’s part of a one-hour special on fashion that will appear on many NPR stations across the country. Kosovo has officially declared independence from Serbia. WAIW? would like to officially recognize the country’s independence. After all, if you don’t like me and I don’t like you why should we live together. Cold colorless concrete. Oil stained pavement. Barred windows. Communism is alive and well at many bus stations across the world, but perhaps even more so here in Belgrade where efficient inefficiency, for the people, is at its finest.